What can we learn from 10+ years of mobile payments in Japan? Two different types of Docomo‘s “Osaifu-Keitai“, manufactured by Panasonic and by SONY, were publicly tested by 5000 customers between December 2003 – June 2004. Docomo’s Oseifu keitai mobile payment system builds on SUICA NFC stored fare cards, which JR-East brought to market in Tokyo on November 18, 2001, after long years of development and public testing, where the author of this newsletter was one of the testers. Therefore, those who wish to make predictions about how the Apple-Pay market is likely to develop can use the experience gained during 15 years in Japan. There are also some open questions, which will probably be answered after we can all check out Apple-Pay after September 19, 2014. One point which is very important is the speed of transactions – especially in transport applications such as the London or Tokyo Subways – read about this in the next section of this newsletter below. The speed of NFC mobile payments – and why does it take 10 years to reinvent the wheel? and: what is the speed of Apple-Pay transactions? faster than 100 milliSeconds? or 500+ milliSeconds? On July 17, 2012 The Wallstreet Journal reported, that as far as Transport for London is concerned, there is no viable mobile payment solution available at this time, because to the knowledge of Transport for London at that time, mobile payment transactions take longer than 500 milli-seconds, which is too slow for Transport for London requirements (e.g at Picadilly station during the rush hour). Interestingly, in Japan “mobile SUICA” payments have been used in Tokyo successfully since January 28, 2006 at the world’s busiest railway stations including Shinjuku and Shibuya – arguably more busy than Piccadilly Circus in rush hour, with transaction speeds faster than 100 milli-seconds – according to The Wallstreet Journal, London Transport did not even know about this. I guess we will soon learn the answer to this question. Why is it that Japan does not capture the global value which Apple and Apple-Developers will create and capture now? Japan developed mobile payments, e-cash, credit cards in mobile phones and at least as much functionality as Apple-Pay and an open API and a mobile payment and e-cash developer ecosystem over the last 10-15 years. Why does Japan leave all the global value on the table for Apple and Apple developers? Actually, I personally had discussions over the last 15 years will all major players in Japan’s mobile payment and e-cash field, crowned by 1-1 discussions with Docomo’s CEO at that time – Dr. Tachikawa – I wrote about one of these meetings in The Wallstreet Journal, of course without mentioning the details: “Wallstreet Journal leadership question of the week – Japanese leadership“. Essentially my conclusion at that time, and today is, that Japanese companies never showed any interest at all in developing global business to capture the global value of mobile payments, e-cash and the related businesses. Japanese companies did not even try, and were not even interested in discussing the globalization of mobile payment and e-cash technologies and business models. Galapagos effect: how can Japan capture global value from Japan’s new technologies and new business models? All opportunities are not lost of course for Japanese companies in the mobile payments and e-cash fields, but most if not all of Japan’s early-mover advantage has evaporated with Apple-Pay. In business, sometimes the second or third mover can be commercially more successful than the first mover, and it will be very very hard even for a united Japan Inc to stand up to Apple. Wind farms and solar plants deliver electricity not continuously, but output depends on weather, wind and solar illumination conditions. Battery storage technology is necessary to store solar electricity produced during the day for usage during night hours when the sun does not shine. The Japanese Government is planning to build the world’s largest testing laboratory for batteries up to a capacity of 2 Giga Watt hours, largest in the world. Planned investment is on the order of YEN 13 billion (US$ 130 million). The Renault-Nissan Alliance was started on March 27, 1999 with Renault acquiring 36.8% of outstanding Nissan shares, and with Nissan acquiring 15% of Renault later in 2001. Chronological details can be found in the EU-Japan Direct Investment Register. On July 17, 2014, Carlos Ghosn spoke as President and CEO of Nissan Motor Company at the Foreign Correspondents Club of Japan (FCCJ) in Tokyo, we summarize his talk here in this article. Nissan has made great progress to make driving easier, safer and more environmentally friendly. Nissan to bring autonomous drive vehicles to market before 2020. Nissan Leaf has become the leading zero emission vehicle by a large margin. Aging society: need to bridge the generation gap. Seniors need technologies to drive safely until later age. Nissan is determined to innovate in each of these areas and by developing new technologies, Nissan aims to address the opportunities created by these four major megatrends. Today 30 cities of more than 10 million people, including Tokyo, Osaka, Beijing, Shanghai, Sao Paolo, Mexico, Mumbai. Number of megacities will reach more than 50 by 2030, with 1/3 being in China. With the rise of mega-cities in China, it is not surprising that China increases support for electrical vehicles to reduce pollution. China aims that 30% of Government vehicles are electric, and to eliminate sales tax on all electric vehicles. 20% of CO2 emissions come from transport, therefore automotive industry must be part of the solution. Nissan introduces ENV200 electric vans in Europe and later this autumn here in Japan. Electric vans have the potential to change the cost economics of fleet management. Nissan is seeking regulatory changes and consumer adoption to make autonomous driving a reality. Nissan seeks workable regulatory standards. Automatic lane changing and automated parking can increase convenience and safety. Autonomous drive is about relieving drivers of repetitive tasks, particularly in congested or long-distance situations, while the driver remains in the drivers seat and control. Self driving cars don’t require human intervention, and remain a long way from commercial reality. Only suitable for tightly controlled environments at slow speeds, and face a regulatory minefield. Nissan focuses on autonomous drive systems that can be introduced over 4-5 years. Deploying “Nissan Connect” system with bluetooth, apps, cloud base systems. Nissan expects more than 1.5 Million Nissan cars to be connection to enhanced communications by 2015, using cloud systems, delivering access to social media, entertainment apps and voice recognition systems. Last year introduced 22 new technologies alone. Must serve the women customer base and employ women talent. Women control 65% of consumer spending overall, and women make the final decision on the purchase of more than 60% of cars. In the past the vast majority of Nissan employees were men – while 60% of car purchase decisions are made by women! This means that Nissan was missing out on many business opportunities by having an overwhelmingly male workforce and management. In Japan, 7% of Nissan’s managers are women, more than double the average for large Japanese manufacturers, in the past the ratio at Nissan of women in management was 3%, so we have already increased the ratio. Aim to increase the ratio of women managers to 10% by 2017. More women managers ensure that women take part in product management and planning – this is important since the majority of purchase decisions are taken by women. Nissan has a program to make dealerships more woman friendly. Carlos Ghosn: autonomous driving and self driving is very important, and every major car manufacturer is working with Google. Every car manufacturer wants to keep control of its own products. Car makers do not want to become just maker of simple hardware, but wants to control the products. A baby born today has a 50% chance to live longer than 100 years, on average people lose their drivers license sometime around 80 years age. Therefore technology has to change, and technology can help older generation to stay mobile for a longer time. Q: do you intend to go into politics and become President of Lebanon? Carlos Ghosn: Very low probability. I am being accused of accumulating too many jobs. I have just been renewed for another period of four years as CEO of Renault by the shareholder meeting in May 2014. I can make my best contributions where I am now. Q: to you prioritize profit margin or market share? what is your strategy for emerging markets? what are your problems in global platforms? Carlos Ghosn: Power 88 = 8% profit margin, 8% global market share. Profit enables growth. We go to every emerging market. Leadership must begin in emerging markets. We are No. 1 Japanese brand in China. We are aiming to become No. 1 Japanese brand in Russia, in Europe and in South America, particularly in Brazil. We are fighting to become the 2nd brand in Japan. Growth without profit will not last. Without profit we cannot grow, we cannot invest. We are creating joint platforms with Renault, Daimler, Mitsubishi, and Ashok Leyland in India. We are the only company which is successful and productive with alliances. What counts are not handshakes of top management in front of cameras, but the actual platforms and cooperation projects we deliver. The Renault-Nissan Alliance is a world champion in alliances. The automotive industry today is an industry of scale. The largest players are the most competitive and have the highest profits. I am not saying that this will always be like this, this could change. But today the automotive industry is an industry of scale, where to be successful we must offer a large range of products in different product segments. Success for small automotive companies is very difficult, they have to offer a extremely special, hugely attractive model to compete. Carlos Ghosn: What is the question about my salary? The question about my salary comes up regularly at every shareholder meeting and is a kind of ritual. We follow systematic principles. Nissan is in search for global talent. As example the head of Infinity last week left us for Cadillac. There is a global fight for talent, remuneration should not be a handicap but an asset. I have no discretion on the market for talent. We take into account the efficiency of the company, and also local sensitivities, but we have to be competitive. We cannot say: “we need this expert, but we cannot pay him”. We have YEN 1 trillion cash and we are making US$ 6-7 billion profit – saying “we want this talent no matter what” is a sign of vigor and vitality. We will see more and more global professional talent in Japan with established record. Carlos Ghosn: I support the Japanese Government in aiming for more women in management. Concerning Nissan: 60% of all car buyers are women, and what women are looking for in a car is very different to what men are looking for. Therefore women need to have a strong role in designing cars. We need female designers, female engineers, female marketers. Women in decision making positions is not optional but mandatory. 80% of women going to a car dealer want to have a woman sales person, 20% don’t care. 50% of men prefer a woman, 50% prefer a man sales person. Therefore logically, we should have lots of women sales people in our stores, at least 50%. However, at present we only have about 15% women sales people in our stores. This is not logical and must change. Carlos Ghosn: I believe electric cars are most important, and US and China will lead. Infrastructure investments and the speed of development for infrastructure are an issue. Infrastructure is a much bigger challenge for fuel cell cars than for electric cars. Selling 500-1000 cars is not the issue, 100,000 – 200,000 is the issue. Q: Is there friction between Nissan’s mono tsukuri culture, and Renault’s freedom to work less? Carlos Ghosn: The two companies contribute together. Both companies have successes. Renault has a very big success with the Dacia platform, the M-1 platform, is selling more than 1 million cars, and is unique. Renault also has a very strong mono tsukuri culture. As another example, Renault will now move into China on the basis of Nissan’s business platform in China. Renault will copycat Nissan’s plans of building business in China. Carlos Ghosn: we have a global fight for talent. 49% of Nissan’s top management have 13 different citizenships. Its not that 49% are all French. Diversity is out strength. There is war for talent, and that is normal. We have to accept that some talent leaves us when the mission is finished. We have people dedicated on searching for global talent all the time. You can be sure that this job will be soon filled again. Carlos Ghosn: it is in our interest to have the highest number of electrical cars. We are pushing towards standardized charging infrastructure. We all want to promote zero emission cars. Q: Tesla has made patents free: will you use Tesla’s patents? Carlos Ghosn: we are first in electrical cars, we have enough patents, we have no reason not to use Tesla’s patents, but we don’t. Carlos Ghosn: The most important is to take any problem immediately out of the hands of the consumer. That is why we see more recalls recently. First we recall and take the problem away from the consumer, and then we solve the problem. We have an Executive Vice-President for consumer satisfaction and quality, who has full power to reduce all risks on quality. Q: you want to increase the ratio of women in management to 10% by 2017, and Prime-Minister Abe wants 30% women in management by 2020. Carlos Ghosn: I am very modest, and Prime Minister Abe is very ambitious. I do not want a burst of women in management with failures afterwards. I want to advance safely without massacres. I am prudent and conservative. We had less than 2% of woman managers, today we have a solid 7%, and I want to go a solid 10% of woman managers. I don’t want a “flavor of the day”, I want solid stable progress. Q: how does your strategy regarding autonomous driving differ from your competitors? We want to be the pioneers, the battle is to be first and to associate the image of being No. 1 to the brand. We are not aiming to be late with a more perfect product, we want to be first with significant autonomous driving features. Nokia strengthens No. 1 market position in Japan’s mobile phone base station market! Japan’s mobile phone base station market is about US$ 2.6 billion/year and for European companies Ericsson and Nokia the most important market globally, although certainly also the most difficult one. Nokia is No. 1 with a 26% market share, and Panasonic is No. 5 with 9% market share. Nokia acquiring Panasonic’s network division is one of many investments and acquisitions in Japan by European companies. For more details, see the EU-Japan M&A register. We see a pattern here: after failing spectacularly trying to build a mobile phone business in Japan for almost 20 years without success, Nokia is now winning the second time round. Read a detailed timeline in The EU-Japan Investment Register. I believe without success in Japan’s mobile phone base station market, there is a big chance Nokia as a company, or at least Nokia’s NSN division would not exist any more at all today. With a market share of 26%, approx. US$ 700 annual sales in Japan, Nokia is No. 1 market leader in Japan followed by Ericsson on 2nd position. With the acquisition of Panasonic’s base station division, Nokia should be able to expand its market share beyond 26%+9% = 35% and expand its leadership, especially via Panasonic’s deep relationship with Docomo. Because Docomo with its very deep pockets, is traditionally the first globally to develop and bring to market the most advanced radio technologies, a deeper relationship with Docomo will also help Nokia to develop and bring to market new communication and radio technologies. Thus I believe the impact on Nokia will be far more than an increase of the market share in Japan from 26% to 35%. Panasonic System Network’s market share is estimated at around 9% of Japan’s mobile phone base station market, while international sales are essentially non-existent. Thus Panasonic System Network’s global market share is negligible, giving Panasonic little possibility for the scale necessary to operate a stable profitable longterm base station business. Over the last 15 years since 1998, Panasonic has shown no growth in revenues, and average net losses of YEN 85 billion (US$ 0.85 billion) per year, as typical for most of Japan’s top 8 electronics companies and as we analyze in detail in our report on Japan’s Electronics Industries. Panasonic is on 5th rank with about 9% market share in Japan’s mobile phone base station markets, and has little chance and not the capital to scale its base station and mobile phone businesses globally. For Panasonic in it’s current very limited financial situation, focus on core business areas is very prudent. iOS App Store ranking of June 6, 2015 here. Google Play Store ranking of June 6, 2015 here. Lets have a look at the list of top grossing games in the Apple iOS AppStore today. Out of the 25 top grossing games in the AppStore, quite a few are by foreign originating companies. Can you guess which these are by reading the list above? Japan is certainly not a “closed market”. It is obvious that Apple does not discriminate in any way against foreign companies in Japan – and neither do Japanese consumers! Looking superficially at Japan’s renewable energy sector, its easy to overestimate geo-thermal energy, and to underestimate biomass. Currently the installed biomass electricity generation capacity is about 5 times higher than for geo-thermal energy production – a fact often overlooked in superficial discussions. Biomass electricity production is included in Japan’s new feed-in-tariff program which started in July 2012, and is also very generous. The figure above shows approvals for electricity generation projects from biomass under the new feed-in-tariff program, and demonstrates that after a slow start, approvals are now picking up. The sum of biomass generation facilities operating before the introduction of the new feed-in-tariffs plus approvals since July 2012 approaches 4 GigaWatt, which corresponds approximately to the generation capacity of 4 nuclear reactors. Register and receive an email with a link to a free trial version of our report on “Renewable energy Japan” and our newsletters. Register and receive an email with a link to a free trial version of our report on “Japan’s energy markets” and our newsletters. Japan’s ten regional electricity monopoly operators traditionally kept renewable energy below 1% following an unwritten rule. Tokyo Electric Power Company (TEPCO) kept renewable well below this magic 1% limit – until recently TEPCO’s renewable energy ratio was about 0.05%, slightly “greener” than Kansai, and Shikoku Electrical Power Companies with 0.03% renewables, and Chugoku Electrical Power Company with 0.02% of renewables in their energy mix. Switching off all nuclear power stations combined with extremely high natural gas (LNG) prices forced change of this “no renewables” strategy in Japan, and Japan quickly moved in the opposite direction with some of the highest feed-in-tariffs globally, about three times higher than in Germany. (To understand the details of LNG costs and prices for Japan, read our Japan Energy Report, where you’ll find month-by-month data of Japan’s coal and gas payments, as well as the price developments and the reasons for the extraordinarily high prices Japan pays for LNG and LPG). Germany’s Federal Network Agency (Bundesnetzagentur) published detailed data of solar energy projects installed and approved for subsidy in Germany. 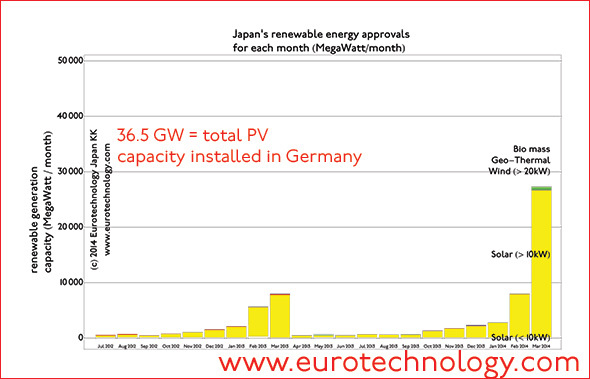 As of May 31, 2014, all solar power ever installed and approved for subsidy in Germany amounts to 36.5 GigaWatt (peak). The figure above shows that Japan’s Industry Ministry METI approved about 26.7 GigaWatt of solar projects under the feed-in-tariff program during the single month of March 2014 alone. The figure also shows that March 2014 is somewhat an anomaly – because feed-in-tariffs are reduced each year on April 1 at the beginning of the new financial year, METI cooperates with applicants to approve large numbers of applications during the last month of the previous tariff. Thus renewable project applications in Japan have developed an annual rhythm. With the annual general shareholder meetings completed and financial results published, we have analyzed the financial results of Japan’s 10 regional electric power companies (plus several other Japanese electricity companies, including J-Power) in detail. We find that each of Japan’s electrical power companies has its own particular circumstances, and some are coping better than others, while of course Tokyo Electric Power Company is a special case due to the incalculable costs of the Fukushima nuclear accident, and due to possible changes in case of a change of Japanese Government policy regarding TEPCO. Our financial analysis shows, that revenues of Japan’s electricity sector have increased substantially, due to increased electricity costs. On the other hand, revenues of Japan’s electricity companies overall have been declining steadily since a peak around 2005, i.e. ten years ago. From our analysis it is obvious that the financial profitability issues of Japan’s electricity sector have started about 10 years ago, long before nuclear reactors were switched off due to the Fukushima accident – while of course the switch-off of nuclear power does contribute to a worsening of the financial situation in the last 3 years. Clearly, the electricity deregulation which is now on track with regulatory and legal changes, was long overdue, and in my opinion is more due to the declining profitability of Japan’s electricity sector, than immediately triggered by the Fukushima accident. The financial data clearly show that a change of business model for Japan’s electricity sector is needed. Our analysis shows that each of Japan’s 10 regional electricity companies have different financial circumstances. We discuss Chugoku Electric Power Company which serves the area around Nagoya in the middle of Japan as an example. The Figure below shows that Chugoku Electric Power Company’s income peaked around 2004-2005, about ten years ago, and since then has been continuously falling, with net income dropping into the red for the first time for Financial Year 2008 (ending March 31, 2009), about two years before the Fukushima nuclear disaster. An important point to consider is that only about 10% of the electricity generation capacity of Chugoku Electric Power Company is nuclear power, which is one of the lowest ratios of nuclear power in Japan. It follows logically, that switching off this 10% of nuclear generation capacity has a much lower impact than for other regional power companies, where the nuclear contribution was about 30%. We conclude that the peak around 2004-2005 in profitability followed by a long decline in profitability indicates a deep rooted need for change of business models which was exacerbated but not directly caused by the Fukushima nuclear accident. Japan’s Government is now reacting to this fact by deregulating the electricity sector. Japan electricity: Why does the current business model need changes? Japan will now follow the global trend from top-down electricity grids with large central generation facilities and a top-down distribution grid to more de-centralized, localized smart-grids, driven by technological progress, and the emergence of renewable energy. Announcement and summary on the website of Stockholm School of Economics. Register and receive an email with a link to a pdf file of the handouts for this lecture. About the talk: Japan’s electricity architecture was put in place in 1952 and was not much changed until 2011. Electricity liberalization, introduction of smart meters and smart grids bring very large investments in Japan’s energy infrastructure, and are creating huge opportunities for Japanese and foreign companies in Japan’s energy sector. At the same time there is much uncertainty about Japan’s nuclear program -will Japan’s nuclear power plants restart? The talk will explain Japan’s energy architecture today and how we arrived at today’s situation and will give you some tools to understand possible scenarios for Japan’s energy and electricity future. of the Japanese company GMO Cloud KK, a cloud services company with about 500 employees and traded on the Tokyo Stock Exchange. Gerhard is also the creator and curator of the Ludwig Boltzmann Symposia on Energy, Entropy and Leadership. Gerhard graduated with a PhD in Physics from Cambridge University, Trinity College, was tenured faculty at Cambridge University in Semiconductor Physics, Associate Professor at Tokyo University’s Electrical Engineering Department, and the first foreigner to lead an elite Sakigake Research project of Japan’s Science and Technology Agency. Watch The Economist interview on Japan’s energy policy. and our report on Renewable energy in Japan. Quick answer: it is impossible for anyone, including the Prime Minister of Japan, to know with any certainty. Long answer: Japan is a democracy. Japan currently is quite polarized for or against nuclear power. Everyone knows that some Japanese leaders including the Prime Minister Abe, are in favor of nuclear power. On the other hand, many outstanding opinion leaders are strongly against nuclear power in Japan, these include Nobel Prize Winner Kenzaburo Oe, and also the former Prime Minister Koizumi. Currently we can observe the evolution of a democratic process in Japan to reach a consensus on the future of nuclear power stations in Japan. This process is different for every single nuclear power station, and it is impossible for anyone to make predictions. Obviously the owners of the nuclear power stations hope to restart their power stations as quickly as possible, and they are supported by many industrial leaders and the current Prime Minister. They need to obtain the agreement by the newly established nuclear power regulator, which was newly established because the Parliamentary Committee which investigated the Fukushima nuclear disaster established that the cause for the nuclear disaster was “regulatory capture”. This committee was chaired by Kiyoshi Kurokawa, and you can read one of his speeches “Groupthink can kill”, and watch YouTube movies explaining the results of his committee here. Sofar none of the nuclear power station was cleared by the new nuclear safety agency, and no one knows when the safety inspection program will be concluded for any of the nuclear power stations, nor which stations will be cleared to restart (in principle) and to which the nuclear safety agency will refuse the clearance. However, clearance by the nuclear safety agency is by far not enough. In addition, in Japan, nuclear power stations need the agreement of the local communities, i.e. the local mayors and Province (Ken, Prefecture) Government Prefects. As an example, the world’s largest nuclear power plant is Kashiwazaki-Kariwa, it is currently owned by the Tokyo Electric Power Company to supply Tokyo with electricity, and it is located approximately 80 km from the Prefecture capital city Niigata-shi, which has about 1 million inhabitants. The current very outspoken Governor (Government Leader) of Niigata-Prefecture, Hirohiko Izumida (泉田 裕彦), has clearly stated his opposition both to the restart of the Kashiwazaki-Kariwa nuclear power station, and secondly he has also stated that he considers Tokyo Electric Power Company unsuited to manage a nuclear power station. Read and watch a video of Governor Hirohito Izumida here. I have read speculations that as a consequence it might be thinkable that ownership and/or management of the Kashiwazaki-Kariwa Nuclear Power station could be transferred to a different power company to overcome this local resistance. But it is not possible for anyone to predict how this will play out. It is my understanding also, that in Japan it is not clearly defined which local authorities have to agree before a nuclear plant can operate, and which distance from the nuclear power station is still close enough that agreement of local authorities is needed. In my understanding also it seems to be unclear which type of local authorities have veto power: The Prefect (i.e. the chief of the Prefectural Government), cities, towns, villages etc. There seems to be much uncertainty here, which did not exist in the past, or which did not come out into the open in the past. Another factor is the local geological situation for each nuclear power station. In Japan there are legal requirements that nuclear power stations need to be located away from active geological faults. Recently there have been investigations by geological experts about the geological conditions near the nuclear power stations, but my understanding is that many questions are still unsettled at least for some of the nuclear power stations. Still another factor are the courts. Traditionally Japanese courts have rejected all complaints against the operation of nuclear power stations, but I hear that recently some court complaints against the operation, or against the restart of nuclear power stations have been successful. Court decisions also cannot be predicted by anyone. So in summary: No-one can possibly predict what will happen with Japan’s nuclear power stations. When pushed, I sometimes say that a possible scenario will be that about 10 out of Japan’s approx. 50 nuclear power stations might be restarted in about 3 years from now. However, no one can know this for sure, and no one can assign a probability to any outcome. There have been enquires by some non-Japanese/foreign media, which interviewed a number of experts, asked them to estimate the probability for each of Japan’s nuclear power plant, and then took some kind of average of these experts opinions. I was also asked to participate in this experts’ enquiry, but I refused to participate, and said that simply no one can know with any precision at all. Reuters reports that Japan’s Prime Minister Abe urges company boards to reform corporate governance to include independent directors. I added the following comment. The question of independent Board Directors is often framed in terms of exercising shareholder power over the company, as is the main message of the article above. Another focus of discussions on the role of outside independent directors, is during emergencies, and here the Olympus case is often cited. However, in my experience in Japan, including my work as a non-Japanese independent Board Director of a public Japanese company, enlightened companies will welcome independent Board Directors for their know-how and contributions to the company – in the end the market decides. In the end regulations have limitations, and the realities of the market decide, as is the case of SoftBank. As another example, SoftBank appointed Marcelo Claure, CEO of Brightstar Corporation and of Bolivian origin, to the Board. Masayoshi Son announced the appointment with the following words: “Marcelo’s experience as an entrepreneur and businessman who created and successfully grew a global telecommunications company will bring an invaluable perspective to Sprint’s board.” Note that Masayoshi Son clearly states that Marcelo Claure is appointed to bring invaluable know-how and experience to SPRINT, Masayoshi Son does not seem to be motivated by “increasing the power of the shareholders over Sprint“. The “power of shareholders” is usually a matter or last resort, when all other methods fail. Usually, when you have to show your power, its too late. Answer summary:The Government in its new strategy summarizes Japan’s energy situation and proposes a cocktail of different energy sources. Everyone knows that Prime Minister Abe is pro-nuclear energy, but that does not mean that he is against other energy sources, such as renewables. The new energy strategy paper though misses KPIs, Key Performance Indicators. There are no many numerical targets. Japan energy policy Question: It is often repeated that Japan is poor in energy sources, is this true? Answer summary:Yes, that is often repeated without thinking, and thats also the case in the introduction of the new policy paper. This is only true as long as we restrict our view to traditional carbon based primary energy sources such as oil, gas, or coal. But if we widen the view to renewables such as wind, water, solar, biomass, and geo-thermal energy sources, then Japan is actually very rich in primary energy sources, and could even aim for energy self-sufficiency. Off-shore wind alone would be sufficient to make Japan energy self-sufficient. Just by repeating the statement many times, that Japan is poor in energy sources, does not make this statement true. The new energy policy paper also starts out by saying the Japan is poor in primary energy sources. This is not true if we widen the view to renewable energy sources. Japan energy policy Question: Re-engineering the electricity grid. Can you explain the concept? Answer summary:The electricity grid has evolved over many years, maybe 100-150 years. The traditional architecture of the electricity grid is a top-down one-way distribution network from large central power station such as large coal-, gas- or oil-fired power stations or nuclear power stations, to consumers. The traditional electricity grid is similar to the arteries in the human body, where there is the heart in the center, and the arteries distribute the blood to the extremities. This traditional top-down grid has served us very well for a long time, but the time as come now to evolve the grid to the next stage. There will be more distributed power generation, which feed in electricity in the opposite direction from the extremities, and there will be more intelligence in the grid. Japan energy policy Question: How do you see Japan deal in the future with supply and demand management, how do you see electricity prices evolve in Japan? Answer summary:With the liberalization there will be more flexibility in the pricing of electricity and supply and demand management. Prices will not necessarily go down, but will depend much more on the timing of demand, on demand/supply management, or on the value of electricity. For example, mission critical electricity consumers such as data centers or hospitals will need a different type of electricity supply, than washing machines in households. Demand/supply management and smart grid will manage the timing of less critical electricity usage. Japan created much of today’s global game market with icon’s such as Nintendo. However, today the moment has been taken over by new online game companies. Their combined income now exceeds the traditional icons. We wrote in our blog first back in 2009 about the disruption of Nintendo’s blue ocean (Wii and DS) by smartphone app stores. Today, 25 Japanese online game companies listed on the Tokyo Stock Exchange, have a combined market cap of about YEN 3000 billion (US$ 30 billion). This list does not include LINE, which is a private company, and has built a substantial games business. LINE announced quarterly revenues on their website, the revenue data are redrawn below, with approximate US$ amounts shown as well. Extrapolating assuming continued linear growth, we can estimate expected annual LINE revenues of YEN 70 billion (US$ 700 million) for the full year 2014. Yesterday I was interviewed by Wall Street Journal about future prospects for SONY, and we discussed SONY‘s need for new “killer” products. Considering Facebook’s acquisition of WhatsUp, we thought SONY would need a “killer application” such as LINE. However, since SONY‘s current market cap with US$ 18 billion is of similar size as WhatsUp’s acquisition value, and presumably LINE’s value will be in a similar range. Thus purely theoretically, considering the growth rates of both companies, it would be more appropriate for LINE to acquire SONY than the other way round. Purely theoretically of course. SoftBank overtook both Docomo and KDDI in all major KPIs: SoftBank’s annual revenues, operating profits and net after-tax profits are higher than NTT-Docomo’s and KDDIs. To understand SoftBank, read our report about the Softbank Group, and read our report on Japan’s telecom sector. The reason for SoftBank overtaking NTT-Docomo and KDDI are both excellent performance of SoftBank’s core businesses, mobile communications and media in Japan, and also a series of recent investments: SuperCell, GungHo, SPRINT, BrightStar, eMobile/eAccess, Willcom and more which all have been very successful investments sofa, not counting Alibaba, which of course is an amazing success story. Going forward, of course the key questions now are the turn-round of SPRINT, and whether SoftBank can succeed with the much rumored acquisition of T-Mobile in the USA, and possibly also a major European acquisition. We have today updated our Report on Japan’s telecommunications landscape, to include latest financial and subscriber data, and latest M&A activities: Japan’s telecommunications market is one of the world’s most active also regarding M&A and restructuring. “Outside Directors” is only one step along the way to end the “inbreeding problem”. Bringing diversity into the management of Japanese companies is critical for growth in Japan: non-Japanese directors, women directors, non-Japanese women directors. Of course the market decides: I believe that companies which do not bring in management diversity will find lower market capitalization than those which do. I am European and independent Board Member of a Japanese company, traded on the Tokyo Stock Exchange. Since all business and all board meetings are in Japanese, full command of business Japanese is necessary, including the ability to read a big volume of Japanese reports 100s of pages long sometimes from one day to the next. There are only very very few non-Japanese people with the qualifications to serve as independent Board Directors, who have the necessary full command of Japanese. So there is a substantial bottle neck against bringing diversity into Japanese corporations even if there was a strong pull from Japanese corporations. Currently only a few excellent Japanese corporations exercise this pull, to pull in non-Japanese external Board Members. One company which is remarkably advanced is Hitachi – Hitachi several outside and non-Japanese Board Members, including also one foreign woman recently. Japan is the world’s No. 1 top grossing app market both for iOS apps and for Android apps, as we discussed before. Supercell recently opened operations in Japan, and attracted major investment by SoftBank and SoftBank affiliate Gung-Ho. Supercell currently advertises with large scale posters on the platforms of one of the busiest rail stations globally, Tokyo-Shibuya. Currently Supercell’s “Clash of Clans” is ranked on No. 10 position of top grossing iPhone Apps for all categories combined, while GungHo’s “Puzzle & Dragons” is on No. 1 (Gung-Ho is investor in SuperCell). On April 25, 2014 NTT-Docomo announced annual results for FY2013 (April 1, 2013 – March 31, 2014) and explained the way forward. net income is YEN 464.7 billion (US$ 4.6 billion). These figures are of course amazing results, and Docomo remains one of the most important mobile operators globally. ensuring that Docomo will remain a leading edge mobile operator for the foreseeable future. Docomo announced withdrawal from the joint-venture with TATA-Teleservices in India, thus another of Docomo’s ventures to create growth outside Japan has failed. This is the last in a very long string of failures of NTT-Docomo outside Japan, after having lost about US$ 10 billion on investments in KPN-mobile, AT&T-Wireless, and Hutchinson, and the attempt to develop i-Mode mobile internet services in many countries. NTT-Docomo has now been overtaken by SoftBank on most key performance indicators (KPIs). SoftBank has achieved higher overall subscriber numbers, higher revenues, higher operating income and higher net income than NTT-Docomo. Economist Corporate Network held a breakfast briefing today April 24, 2014 for about 50 Japan-CEOs and executives. Mr Shigeki (Sean) Miwa, General Manager of SoftBank’s CEO Office, and Representative Director & CEO of Bloom Energy Japan KK, and EVP of SB Energy Corporation, explained SoftBank’s and Masayoshi Son’s reasons for entering the energy business, and he explained Bloom Energy’s offering of energy sources based on very efficient fuel cells in Japan. You can find detailed data and analysis in our report on Japan’s energy sector, and on Japan’s renewable energy sector.